Right here, at this corner of the house, decades of construction technology unite. 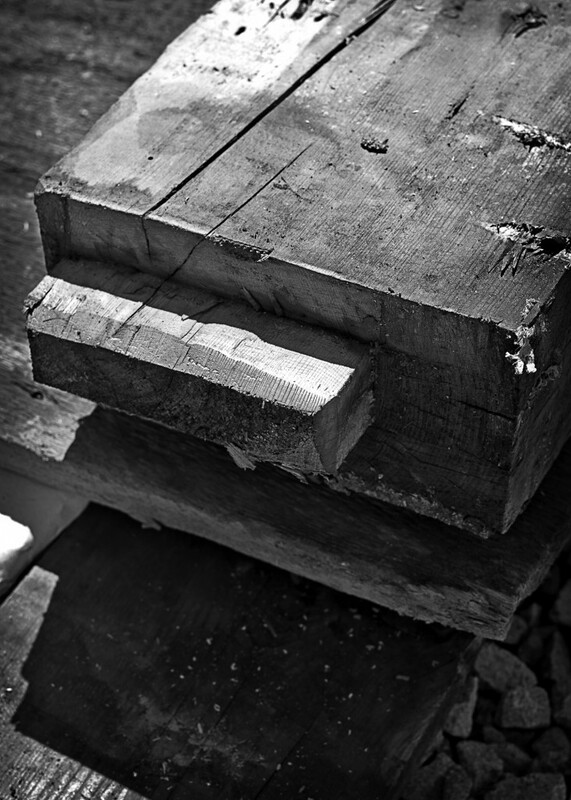 Solid, rough-hewn wood; mortise and tenon joinery and wide planks of old growth pine meet steel and LVLs and strand board and wood I-beam joists. Oh the romance of mortise-and-tenon joinery! but used for balloon construction which, unmodified, kills people. 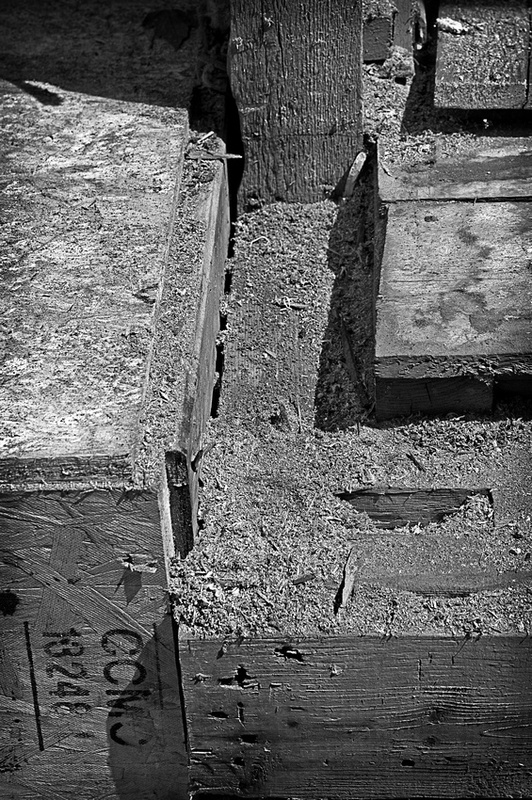 Wide board subfloors destroy ancient trees, while strand board uses up waste products and spares some trees. It isn’t wise to save everything. Or cling to old methods, just because of romance. A house is a long term commitment. Are ten-inch rafters hung from fourteen inch glue-lam beams stronger than old-growth full-eight-inch rafters hung from an eight inch beam? Do steel straps bind timbers tighter than mortise and tenon joinery? The construction crew laugh and tell stories about over-engineering. While they laugh, one worker discovers the center staircase hangs from a splintered board that could have failed at any time. But didn’t. The laughter stutters into shivers. Stories of construction nightmares worse than this are shared in half-cocky, half-nervous tones. A roofer lights up a cigar. The odor of cigar envelopes us as, doused in a glass of water, it makes a sharp sniff and its owner slams out the screen door to dispose of it. “How many times do you think that door has slammed?” one guy asks. Estimates run around the room as coffee break winds down and work begins again. One hundred and forty years this house protected a few generations of three families, through hurricanes and nor’easters, bitter cold, and two-hundred-year rains. The original slate roof still works. The plaster walls and trim still decorate the front rooms. The balustrade is still sturdy. The windows, with a bit of modern ingenuity and copper, still glide open at a fingertip’s whim. If the design is right, this union of old and new will not be torn asunder in future decades by laughing workers bent on some new fashion. The cigar-smoker slams back in. “Let’s make this a house you can smoke in,” he grouses. “Let’s make it a house nobody is smoked in,” another counters. One Response to "May-December Romance (Memory)"
amazing photography.I have inspired for this post.Feeling glad after seeing your good post. Keep continue sharing .